Paul Cook believes Wigan Athletic were only ‘a little bit of quality and belief’ away from turning a point against Brentford into a potentially priceless victory. 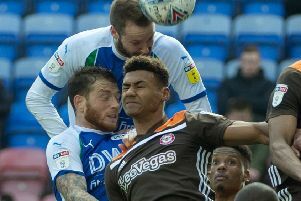 Latics were held to a goalless draw by the Bees, whose goalkeeper Luke Daniels pulled off three outstanding saves to deny Reece James, Gavin Massey and Chey Dunkley. Dunkley also hit the bar late on, with Anthony Pilkington having a goal chalked off for offside, as Cook’s men had to settle for a point. “I always felt there was a goal in us,” assessed the Wigan boss. 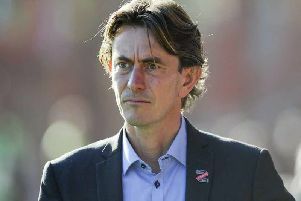 “We had to defend deep at times, and rely on the counter attack. “And maybe with a little bit more quality and belief, we might have got the goal. “In terms of penetration and effort, I did think we had the better chances. “While there’s a tinge of disappointment not to have won it, you have to respect the opposition and the league and it’s a point towards where we want to be. “Our lads gave everything once again and, as a manager, you can’t ask for any more. “You take the point and move on to the next game. Latics dropped a place in the table to fifth-bottom, although they increased their buffer over third-bottom Rotherham to four points. “The biggest stat for us is not the league position, it’s the points tally and how far clear of the bottom three we are,” added Cook. “If people want us to finish as high as we can, that’s all great. “But anything clear of the bottom three has always been the target. Latics were played off the park in the corresponding fixture back in September at Griffin Park that the hosts won 2-0. And Cook says picking up a point against quality opposition shouldn’t be underestimated. “They’re a good side, everyone will have been able to see that,” he added. “When you see them at their best, you wonder why they aren’t further up the league table. “They’re one of the best teams we’ve played this year, and they’ve given us a strong test. “I thought we managed the game well against a side who dominate the ball against everyone. “The big disappointment is we didn’t have more quality in terms of creating chances.